An aorto-bifemoral or aorto-femoral bypass involves dissection of the common femoral arteries in the groin, followed by a laparotomy, dissection to the abdominal aorta, and then clamping of the artery below the renal arteries. For the iliofemoral approach this can be achieved through a low midline incision and the clamp applied to the common iliac artery. The aorta is then opened (Fig. 1) typically to undertake an end to side anastomosis (as this still permits some native perfusion on the lumbar and inferior mesenteric arteries) or end to end anastomosis (if there is concurrent aneurysmal disease). A tube or bifurcated graft is then sutured from the proximal arteriotomy to the femoral artery. Figure 1 – Aortobifemoral bypass. 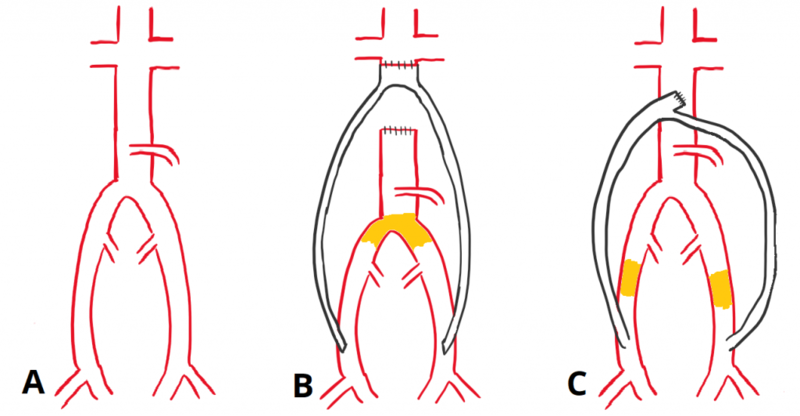 A: Normal anatomy; B: End-to-end anastamosis; C: End-to-side anastamosis. Haemorrhage Particularly in the case of severe atherosclerotic disease, clamping below the renal arteries can be problematic and the blood loss can be extensive, requiring use of a cell-saver machine as an absolute minimum, often also requiring blood transfusion(s). Scarring A midline or transverse incision will result in a scar, which may form a keloid scar, particular in high risk ethnicities. Seroma A swelling of lymphatic fluid may occur in the abdomen or groin due to disruption of the lymph nodes and channels. Careful dissection of the lymphatic nodes and channels with ligation will minimise this risk. Bowel ischaemia The inferior mesenteric artery may be excluded during the procedure. Collateral circulation from the superior mesenteric artery and coeliac axis will usually prevent this complication, however in cases of SMA or coeliac stenosis bowel ischaemia may occur. Hernia Any laparotomy incision has the potential to cause a hernia in future. Avoid heavy life for 6 weeks post-surgery. Graft occlusion A kink or narrowing in the graft can lead to occlusion and acute limb ischaemia, requiring thrombolysis, embolectomy, or placement of a new graft, however this is uncommon in these types of bypass surgery. Reintervention The reintervention rate for aortic or iliac femoral bypass grafts is small compared to more distal grafts, but may occur due to any of the reasons outlined above.